​The Blue Buffalo pet food company was founded in 2003 as an all-natural pet food company by Bill Bishop in an effort to create a high-quality, balanced diet for the family dog, Blue, who suffered from a number of health issues. Bishop and his family sought to produce a pet food that was made with only the highest quality ingredients available and that is exactly what they have accomplished (this was an important finding from our Blue Buffalo reviews). More than a decade after the founding of the company, Blue Buffalo has become a household name in quality pet nutrition, offering four different product lines including all-natural, grain-free, protein-rich, and limited ingredient diets. 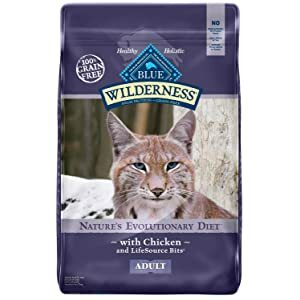 Rating: This Blue Buffalo Wilderness Recipe receives a ​Pet Love Today rating of 5 out of 5, which is in line with other Blue Buffalo reviews online. ​Blue Buffalo cat foods can be purchased at a variety of local and national pet food chains including specialty stores and some veterinary offices. You can find retailers of Blue Buffalo products by typing your zip code into the search bar at the top of the website or at the bottom of the home page. You can also buy Blue Buffalo products from some online pet food retailers like Chewy.com and PetFoodDirect.com. Blue Buffalo develops and manufactures its own products, though there are some claims that blue Buffalo shares manufacturing facilities with other brands. 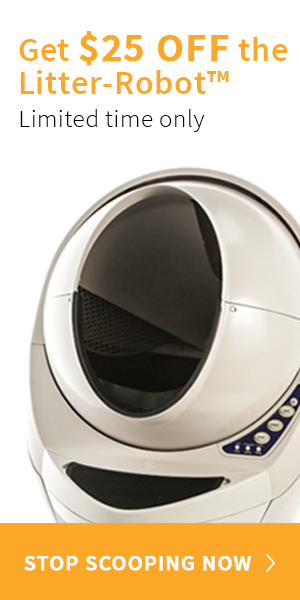 According to the Blue Buffalo website, all of Blue Buffalo’s cat food products are manufactured in the United States. Blue Buffalo creates and develops their own recipes with input from qualified veterinarians and PhD nutritionists. All of Blue Buffalo’s ingredients come from USDA-approved and inspected facilities. The company only works with United States partners to manufacture their products and there are strict control measures in place to ensure that both the ingredients and the final products adheres to the highest quality standards. The Freedom line of cat foods is all-natural and ​grain-free​, designed to satisfy the high-protein, low-carbohydrate nutritional needs of cats. The Basics line of Limited Ingredient Diets (LID) is made with novel sources of protein and carbohydrate, especially suited to cats with unique dietary needs. The Wilderness line of cat foods is meat-rich and grain-free, inspired by the natural diet of wild cats. In addition to using only the finest ingredients in their formulas, each and every Blue Buffalo cat food recipe includes their exclusive LifeSource Bits. These kibbles are made with a precise blend of antioxidants, vitamins, and minerals from seven power-packed ingredients: apple, blackberries, blueberries, cranberries, pomegranate, pumpkin, and spinach. 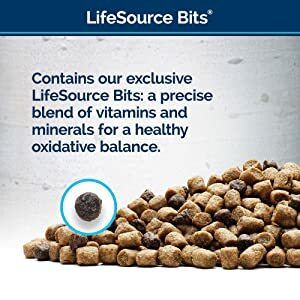 These LifeSource Bits are added to Blue Buffalo products to help support a healthy immune system, to improve oxidative balance, and to meet life stage requirements. These special kibbles are cold-formed, not rendered, to guarantee the potency of the ingredients and to ensure maximum nutrient absorption. ​This Blue Buffalo Wilderness Chicken Recipe is designed to promote healthy muscle development, healthy digestion, healthy weight, and healthy skin and coat as well as a healthy immune system, heart, and eyes. Like all of Blue Buffalo’s products, this recipe also contains LifeSource Bits for enhanced nutrition and more natural flavor. Overall, this dry cat food recipe is made with top-quality ingredients in a well-balanced formula that any cat is sure to love. ​Deboned Chicken, Chicken Meal, Turkey Meal, Tapioca Starch, Chicken Fat (preserved with Mixed Tocopherols), Peas, Dried Egg, Pea Protein, Flaxseed (source of Omega 3 and 6 Fatty Acids), Tomato Pomace (source of Lycopene), Natural Flavor, Potatoes, Menhaden Fish Meal (source of Omega 3 Fatty Acids), Alfalfa Meal, Choline Chloride, DL-Methionine, Dried Chicory Root, Potato Starch, Potassium Chloride, Calcium Carbonate, Caramel, Taurine, Mixed Tocopherols (a natural preservative), Sweet Potatoes, Carrots, Zinc Amino Acid Chelate, Zinc Sulfate, Salt, Ferrous Sulfate, Nicotinic Acid (Vitamin B3), Iron Amino Acid Chelate, Vitamin E Supplement, Yucca Schidigera Extract, Oil of Rosemary, L-Lysine, Parsley, Kelp, Blueberries, Cranberries, Apples, Spinach, Blackberries, Pomegranate, Pumpkin, Barley Grass, Turmeric, L-Ascorbyl-2-Polyphosphate (source of Vitamin C), Thiamine Mononitrate (Vitamin B1), Copper Sulfate, Biotin (Vitamin B7), Vitamin A Supplement, Copper Amino Acid Chelate, Pyridoxine Hydrochloride (Vitamin B6), Calcium Pantothenate (Vitamin B5), Riboflavin (Vitamin B2), Manganese Sulfate, Manganese Amino Acid Chelate, L-Carnitine, Vitamin D3 Supplement, Vitamin B12 Supplement, Beta Carotene, Folic Acid (Vitamin B9), Calcium Iodate, Dried Yeast, Dried Enterococcus faecium fermentation product, Dried Lactobacillus acidophilus fermentation product, Dried Aspergillus niger fermentation extract, Dried Trichoderma longibrachiatum fermentation extract, Dried Bacillus subtilis fermentation extract, Sodium Selenite. The top three ingredients in this Blue Buffalo Wilderness Chicken Recipe are deboned chicken, chicken meal, and turkey meal. These ingredients alone are enough to prove that this recipe is rich in high-quality animal protein. Do not be confused by the word “meal” here. Whereas chicken and poultry by-product meals are made from low-grade and rejected ingredients, turkey and chicken meals are simple dehydrated turkey and chicken. They have been cooked down to a low moisture content around 10% (compared to the near 80% moisture level of fresh meat) which makes them a highly concentrated source of animal protein and a very valuable addition to this formula. 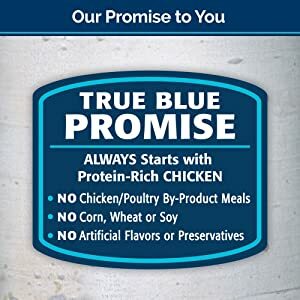 In addition to animal protein, this Blue Buffalo Wilderness Chicken Recipe also includes tapioca starch, chicken fat, peas, pea protein, and flaxseed in addition to various fruits and vegetables plus chelated minerals and dried fermentation products. Tapioca starch is a gluten-free, grain-free carbohydrate which adds to the dietary fiber content of the peas, flaxseed, and various fruits and vegetables in this recipe. Chicken fat is a very valuable addition to this recipe because it provides a highly concentrated source of energy, plus it complements the balance of omega-3 and omega-6 fatty acids from the flaxseed. Chelated minerals have been chemically bonded to protein molecules, making them easier for your cat’s body to absorb and dried fermentation products help to ensure healthy digestion. Previous articleBest Wet Cat Food – 2019!